The following excerpt shows how to expose a WCF Data Service via the Azure AppFabric Service Bus, using a self-hosted ServiceHost. WebHttpRelayBinding is the Azure AppFabric Service Bus binding for the “web programming model”. Zero or more protocol channels, implementing protocols such as WS-Security. One transport channel that send or receives the messages from the transport medium (e.g. TCP, pipes). 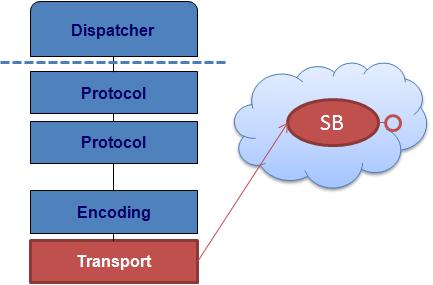 This transport channel uses a message encoder/decoder to translate between the messages handled by the protocol channels and the transport’s byte streams. 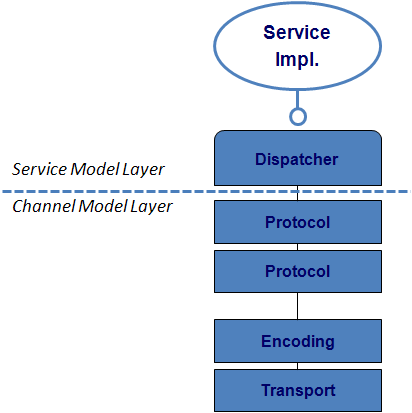 The Service Model Layer is responsible for the translation between messages and service method calls. The System.Data.Services.IRequestHandler interface is a generic Web HTTP programming model service contract configured to accept any URL (UriTemplate=”*”) and any HTTP method (Method=”*”). The base class DataService<T>, from which the concrete data service class derives, implements the IRequestHandler interface. The Azure AppFabric SDK contains several bindings to expose and consume services via the service bus, namely the WebHttpRelayBinding that uses the Web HTTP programming model. This binding defines a channel stack with a RelayHttpTransportChannelListener that opens a TCP connection to the services bus and listens to messages relayed by it. Since the Service Bus bindings extend the channel layer and the WCF Data Services are layered on top of the Service Model Layer, their composition is straightforward. This entry was posted in Uncategorized and tagged azure, WCF on June 23, 2010 by pedrofelix.